Archilles Tendinopathy is a chronic, yet common condition in sports people and recreational athletes. In the past treatment options have been limited due to a poor understanding of its cause; however recent research has revealed valuable information that has provided further treatment options. as Achilles Tendinitis. However, research has found that this type of injury does not involve inflammation and is most likely due to a series of microtears (tendinosis) that weaken the tendon. The Achilles tendon is a large tendon at the back of the ankle. 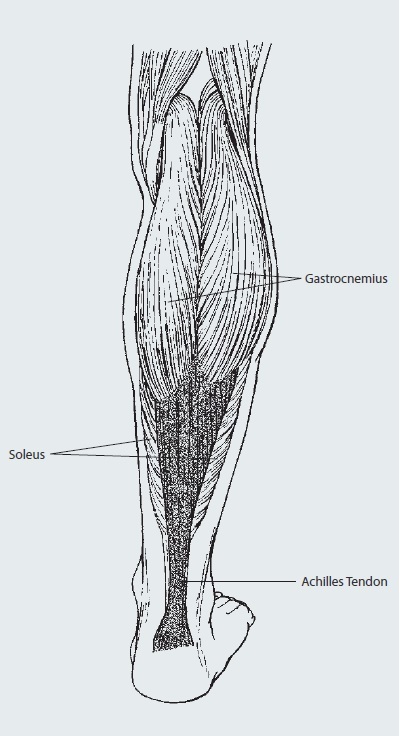 The tendon is an extension of the gastrocnemius and soleus (calf muscles), running down the back of the lower leg attaching to the calcaneus (heel bone). The Achilles tendon connects the leg muscles to the foot and gives the ability to push off during walking and running. A decrease in recovery time between activity. An Achilles tendon rupture is a complete or partial tear that occurs when the tendon is stretched beyond its capacity. Forceful jumping or pivoting, or sudden accelerations of running, can overstretch the tendon and cause a tear. An injury to the tendon can also result from falling or tripping. Achilles tendon ruptures are most often seen in ‘weekend warriors’ – typically, middle-aged people participating in sports in their spare time. Less commonly, illness or medications, such as steroids or certain antibiotics, may weaken the tendon and contribute to ruptures. Wearing appropriate shoes for the activity. Using correct technique to limit excessive stress on the Achilles tendon. Strapping and taping the ankle to assist in creating a more secure structure. Participating in regular strengthening and stretching sessions to maintain muscle strength and flexibility. Mild to severe pain and tenderness in the Achilles tendon area (tenderness may be more noticeable in the morning). Stiffness that may diminish as the tendon warms up with use. Decreased strength and movement; a feeling of sluggishness in the leg. Achilles Tendinopathy is graded from 1–4 according to severity. 2 (moderate) Pain before and after running, pain gradually lessons during a run. 3 (severe) Pain with activity causing a decrease in volume of activity. An Achilles tendon can partially tear or completely rupture. While a partial tear presents similar symptoms as a Tendinopathy, a complete rupture causes pain and sudden loss of strength and movement. The pain is likened to a hit or kick in the back of the leg. Treatment includes rest, pain relief, stretching exercises, and changes in sports techniques and footwear to reduce stress on the tendon. Surgery may also be required in some instances. The use of crutches may be recommended to keep weight off the injury. Taping, a heel raise or even a plaster cast may also be used if the injury is severe. Other treatment may include ultrasound, mobilisation, stretching, sports massage and orthotics. Anti-inflammatory medication may also be prescribed to reduce pain. rehabilitation followed by a strengthening program. These will be completed under the supervision of a sports medicine professional. Return to activity should be gradual. When returning to activity a heel raise or taping may be used to reduce the load on the weakened Achilles tendon.